The following will help you understand the construction and permitting stages of your pool building project and explain how all the “pieces come together”. Once Monogram receives your signed contract (the official “go ahead”) with your 10% deposit, we will schedule the surveyor to start the engineering work for you property. Our engineer will request copies of any plot plan data available from your township. Upon receipt, he will visit your property to measure the elevations so he can prepare a full, detailed site plan to submit to the township. This usually takes 2-3 weeks including the time to get the property information from the township. Monogram will prepare detailed drawings and provide all necessary paperwork for the township/county. This stage usually takes 2-4 weeks, but some townships require extra submissions and approvals from the county, so that could add to the approval time. Although rare, some townships can take up to 3 months to give us a permit! After we receive the approval from the township, we are permitted to perform a “PA One Call,” which notifies the state that we will be digging on your property. Within 5 days of receiving the request, the state will mark any underground utilities and give us the OK to start digging. Monogram will spray paint the pool in your yard so you can see exactly where we will be digging and placing the equipment pad. We will notify you of when we will be spraying out the pool so that you can give us your final approval on the location. Since our hands are generally tied while waiting for government approval, this is typically a good time to start making your color selections. Monogram will contact you to discuss your quartz/pebble interior plaster pool finish, tile selection, slide colors, and possibly concrete decking. 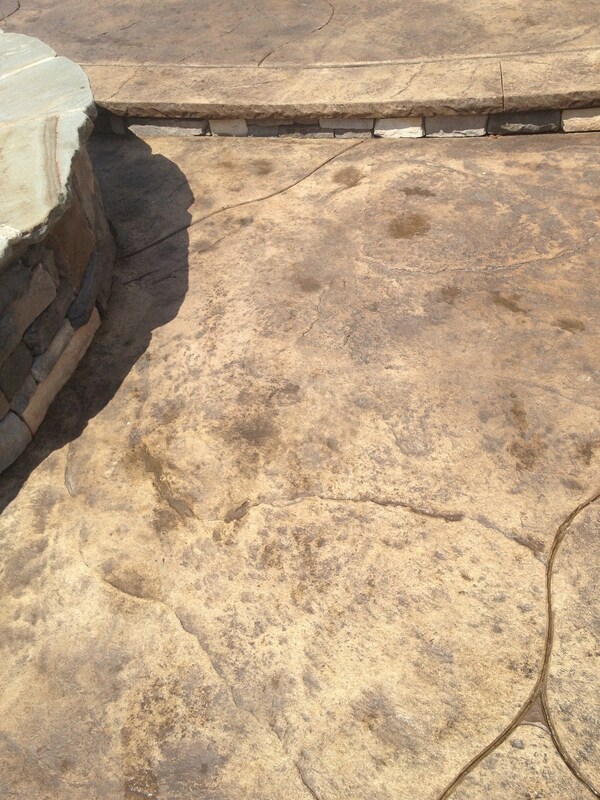 We would like to have your pool finish choice before we shoot the gunite. Depending on the weather and our backlog, we typically will start excavating your pool within a week of the completion of the PA One Call approval. We form the pool with wood forms using the detailed plans that we made for the permit phase and then excavate your pool to the correct depth and size. Excavation lasts about 2 days. The plumbing for each pool is designed specifically to give it the best circulation and filtration for crystal clear water and ease of maintenance. We perform hydraulic calculations to ensure that all equipment and piping are of the correct size to combine water clarity and energy conservation. The plumbing phase of your pool project lasts 1-3 days. Soon after plumbing is complete, you will hear the early morning rumble of the large gunite trucks at your house. 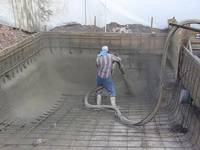 The gunite is applied by high pressure air to the steel reinforcement. This is one of the more interesting phases to watch in the pool building process and our guys are not camera shy, so feel free to take some pictures (and upload them to the Monogram Facebook page if you desire). This stage takes 1-2 days. The gunite is required to cure for a minimum of 28 days before we can apply your quartz/river rok plaster finish. For the first 2 weeks of this curing, you will need to water your pool shell with a hose 2 times a day to help ensure that you get the strongest pool shell possible. Please make sure you water the entire shell to the point that the entire shell is goes from light gray (dry) to dark gray (wet). Our electricians will arrive at your house during the gunite curing phase in order to hook up any automation equipment on your pool and connect the power to your main circuit panel in your house. The electricians will need access to your house, so Monogram will let you know the exact date they are coming. The electricians need 1-2 days to complete their hook ups. Unfortunately, the rain phase can be (and probably will be) anywhere in the schedule. And even if it isn’t raining on your scheduled work day, rain from the previous days might have pushed back everyone’s schedule. All pool builders hate rain delays more than anything, because the domino effect is very painful to everyone. One day of heavy rain can cause a multiple day delay. For example, if your work is scheduled for Tuesday and it rains on Monday, the Monday job will get pushed off until Tuesday (or Wednesday if the soil is really wet) which means your job will get pushed back at least 2 days. And even though it may have been sunny on your scheduled work day, the jobs that got pushed off from the rain took your spot. In addition, the threat of rain may cause some delays also. There are certain stages that need a couple of dry days. For example, if we are scheduled to dig your pool on Monday and there is a threat of heavy storms on Tuesday, we most likely will delay your dig until the predicted storms pass. This risk of a pool cave in from the rain isn’t worth it. We will do our best to minimize the impact of weather on your jobs, put please remember, our “anti-rain dance” hasn’t really worked well…but it is entertaining to watch. During the gunite curing phase, the decorative tile will be installed in your pool. Monogram will contact you early in the process to help you choose your tile. We have dozens of samples including our custom, Monogram Pebble tile. The tile phase lasts 1-2 days. If you’ve chosen to have landscaping added to your pool either by Monogram or another landscaper, this work typically starts after the gunite shell is formed and continues until the end of construction. Depending on whether you added slides, boulder walls, waterfalls or large planting areas, this phase can and often will push your construction timeline past the 60 day mark, as we can’t finish and fill the pool until all the “dirty” landscaping is completed. At the end of the gunite curing phase, we will pour your concrete decking. This takes 2-5 days depending on your finish type. The end is near! 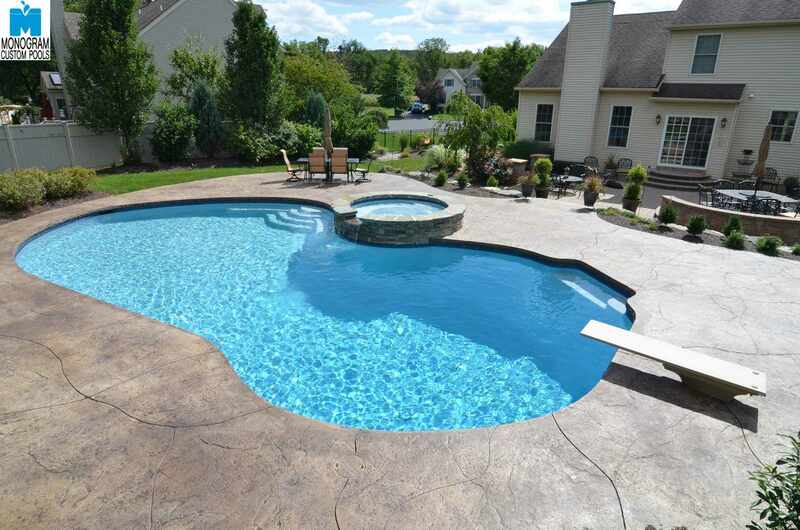 We will plaster your pool and fill with crystal clear water the same day. This takes 1 day and marks the completion of your pool construction. Monogram will start your pool at the same time and set the pump to run continuously during this plaster curing phase. We will also give you instructions on required brushing and manual chemical balancing for the first few weeks. Approximately 3 days after the pool is filled, we will return to balance your water and place your start up chemicals in the pool. Since all of the construction vehicles are gone and your pool is now complete, we will remove all extraneous construction materials and waste from the construction site and clean up your yard. Approximately 30 days after your pool was filled with water we can add salt and make your pool “hassle free.” We will also teach you how to use your pool, give you an owners’ manual, and make sure you understand everything about how your pool operates. And remember if you do have questions or require technical support, we are just an email or phone call away. You can also use our customer web portal created just for you. At pool school we will explain how this website works and how to use it to schedule service or determine chemical dosages.